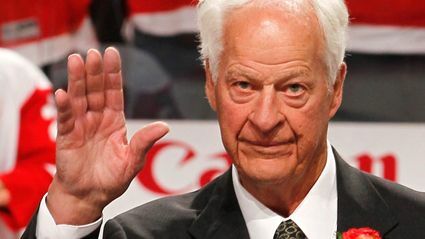 With the passing of hockey legend Gordie Howe last Friday, we pay tribute to one of the greatest players in hockey history, today with our fourth installment of Gordie Howe Week here at Third String Goalie. 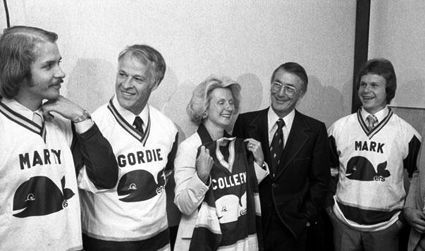 Prior to the 1977-78 season, with their four year contracts with the Houston Aeros having expired, all three Howes, Gordie, Mark and Marty, moved en masse to the New England Whalers where Gordie's streak of 20 goals or more would extend to his 27th season between the NHL and WHA combined, as he would score 34 times to lead the Whalers in goals, as well as points in 1977-78 at the age of 49. He would just miss out on extending the streak again in 1978-79 by the slimmest of margins at the age of 50, when he scored 19 while being limited to 58 games, his first season of less than 60 games since 1949. 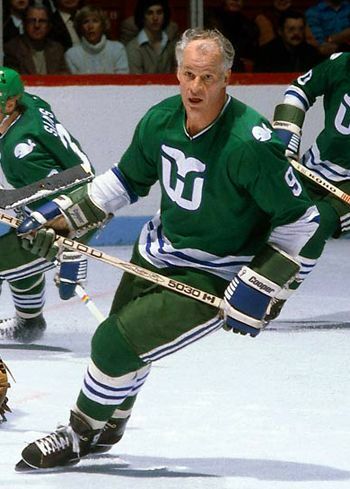 Howe would play one final season with the Whalers, now renamed he Hartford Whalers as one of the conditions of their entry into the NHL. That season was marked by several memorable moments, including being named to the 1980 NHL All-Star Game by coach Scotty Bowman. Howe, Phil Esposito and Jean Ratelle, all stars of the game at the end of their careers, skated out onto the ice at Joe Louis Arena in Detroit alongside the youngest to ever play in the game, 19-year-old Wayne Gretzky, who idolized Gordie as a youngster. Howe was given a tremendous standing ovation by the Detroit fans which lasted so long that he finally had to skate to the bench in an attempt to stop the cheering. When he collected an assist on an insurance goal in his side's 6-3 win, the ovation by the fans in Detroit was once again long and heartfelt. 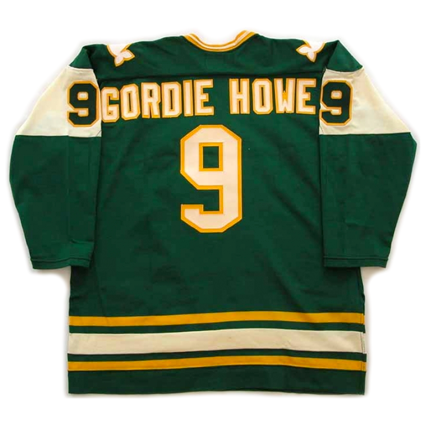 Howe's 15 goals that season would make him the first NHL player to score 800 goals and he would finish his career with a final total of 801, making his final professional total 975, thanks to his 174 goals while in the WHA. 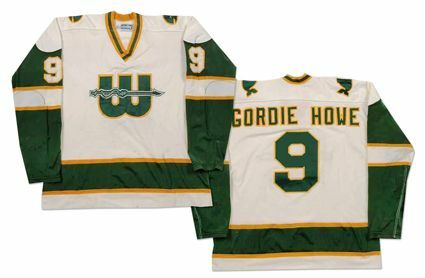 The durable Howe went out in style, playing in all 80 of the Whalers games during his final season, with his last game coming on April 11, 1980 at the record setting age of 52 years, 11 days. 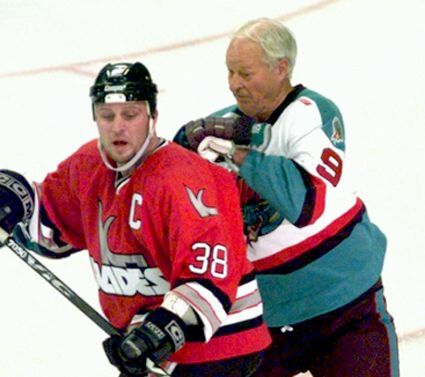 Seventeen years later, Howe would skate one shift in the IHL's Detroit Vipers home opener on October 3, 1997 at the age of 69, making him the only player whose career spanned six decades. Prior to the game, Howe quipped, “I think this is it, but if I get three tonight I’ll be back!" 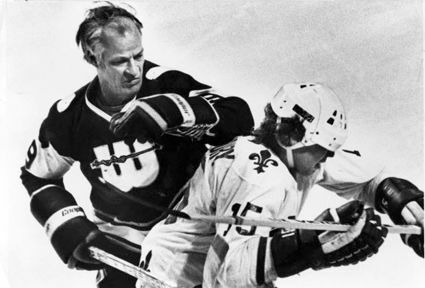 Over the course of his lengthy and productive career, Howe was a 4 time Stanley Cup champion, a 6 time Art Ross Trophy winner, a 6 time Hart Trophy winner, a 2 time Avco World Trophy champion, a WHA MVP, and a 2 time WHA All-Star. 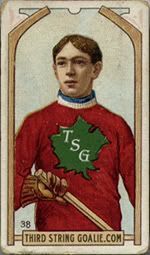 He was named the recipient of the Lester Patrick Award and the Lionel Conacher Award. He was inducted into the Hockey Hall of Fame in 1972, had his #9 retired by both the Detroit Red Wings and Hartford Whalers and was given the NHL Lifetime Achievement Award in 2008. 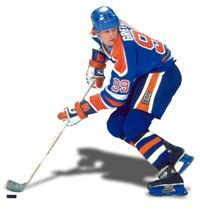 He holds records for Most NHL Regular Season Games at 1,767, Most Games for a Single Team (1,687), Most NHL Seasons Played at 26, Most Goals by a Right Winger (801) and Most Points by a Right Winger (1,850), Most Points by a Father/Son Combo (2,592), Most Consecutive 20 Goal Seasons with 22, First Player to Reach 1,500 NHL Games Played, Most Times Leading the NHL Playoffs in Scoring (6), Oldest NHL Player at 52 years, 11 days, Most NHL All-Star Game Appearances with 23 and finished in the top five in league scoring 20 consecutive seasons and is the only player to have played in five different decades, all of which earned him the well-deserved nickname "Mr. Hockey". 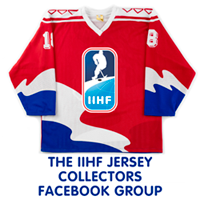 Today's featured jersey is a 1977-78 New England Whalers Gordie Howe jersey. 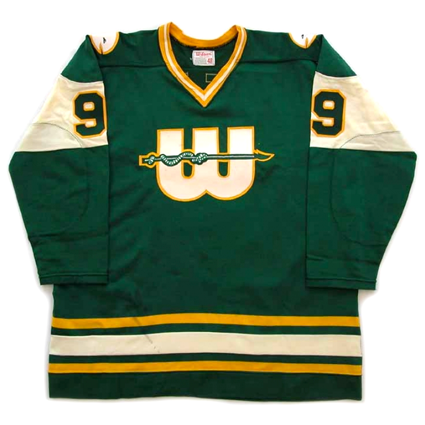 Their original green road and white home 1972-73 WHA jerseys featured a "W" with a harpoon in a circle, which was simplified to just a larger "W" and harpoon for the Whalers second season of 1973-74 plus the addition of gold trim to their green and white colors. Those jerseys survived relatively unchanged for the remainder of their days in the WHA. Upon entering the NHL, and undergoing their name change from "New England" to "Hartford" a condition demanded by the Boston Bruins, the club modernized their jerseys, debuting a clever new logo of a "W" topped off by a whale tail, with the negative space creating a subtle "H" for those clever fans who studied it long enough. 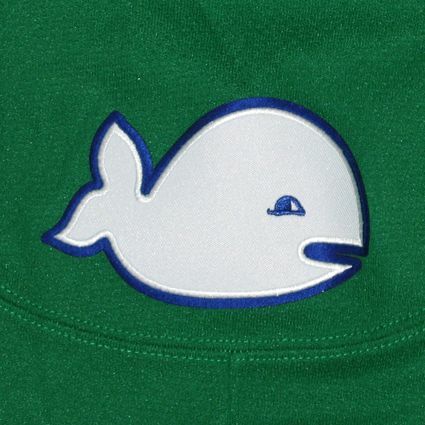 The addition of blue trim made for an attractive set of jerseys, still topped off by the "Pucky the Whale" shoulder patches, worn since day one in the WHA. 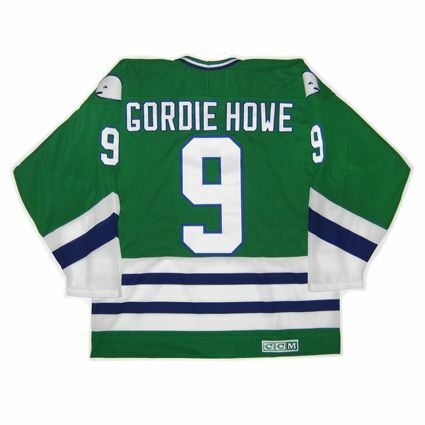 Bonus jersey: Today's bonus jersey is a 1978-79 New England Whalers Gordie Howe jersey. 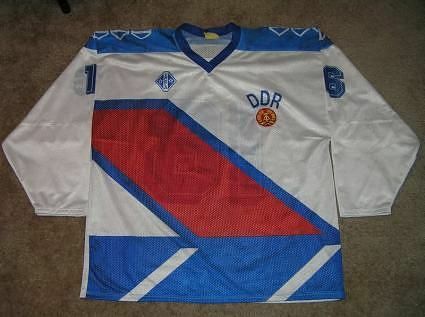 This white home jersey was worn during the seventh and final season of the WHA. Extra bonus jersey: Today's extra bonus jersey is a 1979-80 Hartford Whalers Gordie Howe jersey. 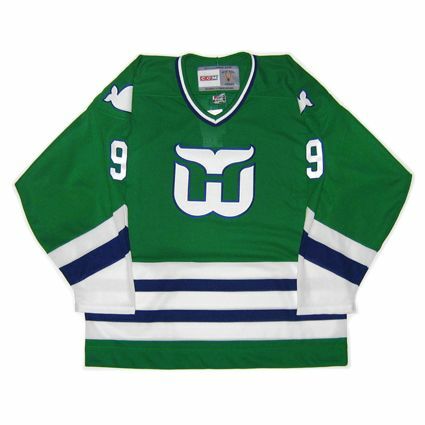 Upon entering the NHL, and undergoing their name change from "New England" to "Hartford" they club modernized their jerseys, debuting a clever new logo of a "W" topped off by a whale tail, with the negative space creating a subtle "H" for those clever fans who studied it long enough. The addition of blue trim made for an attractive set of jerseys, still topped off by the "Pucky the Whale" shoulder patches, worn since day one in the WHA. 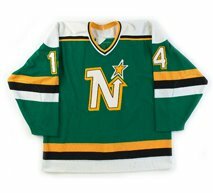 That set of jerseys underwent some minor changes in striping, plus an experiment with the controversial Cooperalls in 1982-83, and the elimination of "Pucky the Whale" in 1983-84, but remained essentially the same basic jersey until the 1992-93 season, when a radical redesign saw the road jerseys no longer green for the first time in club history, as blue was the new main color. In today's video section, first the introductions to the 1980 NHL All-Star Game when Howe got such a memorable ovation by his fans in Detroit. 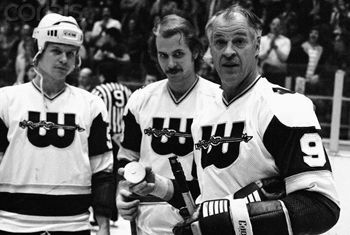 Next, the 69 year old Howe laces them up one final time for the Detroit Vipers to become the only player to play in six decades.